There can be many serious consequences of cirrhosis of the liver. Hepatocellular carcinoma (HCC) is one serious complication that develops as a result of chronic cirrhosis. Some studies have shown that hepatocellular carcinoma is the main cause of death in those who develop a chronic compensated cirrhosis. It is a common condition following cirrhosis and may occur 20 to 30 years after the initial damage to the liver. Hepatocellular carcinoma is primarily a malignant condition of the liver cells. It is a very dangerous condition and may lead to death within 6 to 20 months after its onset. Although most cases occur in patients who have pre-existing cirrhosis, 25% of the patients may not even have a history or risk factors for the presence of cirrhosis. The tumors that are present inside the liver are usually multi focal (75%) hence it is difficult to remove them by surgery. As the disease progresses many metastases may form in the brain, lung, portal vein, bone or the lymph nodes around the portal region. What causes hepatocellular carcinoma in cirrhosis of the liver? 4. Race: it is more common in Asians of Japanese descent. Interventions such as vaccinations against hepatitis and the slowing of alcoholic liver disease might decrease the incidence of hepatocellular carcinoma in the future. However because the latency period from the onset on injury to the development of cancer is so long, it may take many years till some substantial changes are observed in the patient. Only 5% of patients may be cured with surgery. The median survival duration for HCC patients is usually 6 months. The greater the extent of cirrhosis, the shorter is the patient survival time and the more limited the therapeutic options . For example, if portal vein occlusion develops. the predicted survival may be even shorter. • An elevated alpha fetoprotein (AFP) in the blood may hint at the presence of liver cancer in 75% of the patients. Prognosis of the condition is inversely linked to the level of AFP in the plasma. With co-existing signs such as a growing liver mass, cirrhosis and an absence of acute hepatitis, a level of 1000ng/ml may be considered to be presumptive evidence of cancer without confirming with a biopsy. • Des-gamma-carboxy prothrombin (DCP) is another biomarker but it is not as effective as AFP. • By using imaging studies such as liver ultrasound, CT or MRI, hepatocellular carcinoma can easily be seen. 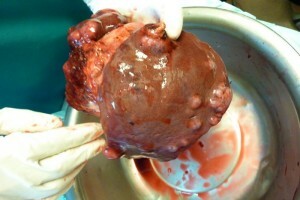 • A liver biopsy is however, frequently necessary to confirm the diagnosis. There is a small risk of the tumor spread along the tract of the needle with this procedure. It may be omitted in the case of a growing cirrhotic mass (more than 2 cm) which has been positive on two consecutive imaging studies . The treatment options available vary depending on the size, location or the number of lesions. It may also be linked to the severity of underlying cirrhosis, presence of metastases or portal vein infiltration. Surgical resection or liver transplantation may offer some hope of a cure. Chemotherapy may offer hopes of palliation for untreatable cases of liver cancer developing in an individual with cirrhosis of the liver.